strings and purls: More Stitch Markers, and the Knitting Moves Along!! More Stitch Markers, and the Knitting Moves Along!! 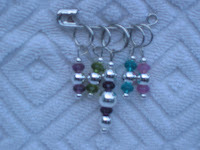 I have received two more sets of stitch markers, and they are great! 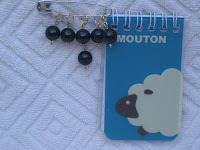 The elegant black ones and the cute little lambie notebook are from Elspeth, and the pretty silver and mulit -colored ones are from Kathy. Aren't they fun? 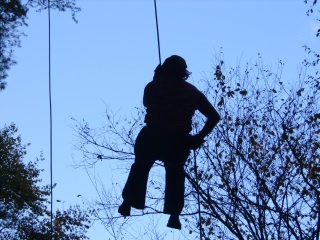 I really enjoyed being a part of this exchange--it was my first one, and I'm anxious to be involved in others. A great big THANK YOU to Sulah, Elspeth, and Kathy for sending me such great markers. I will enjoy using them! Speaking of burning the midnight oil, I have been just awful! Every day I vow that "tonight I'm going to bed at a reasonable hour" and then I stay up even later than I did the night before. Since I refuse to sleep late in the morning, it makes for some very groggy moments during the day, and LOTS OF COFFEE!!!!! It's just so fun to sit up late knitting or spending time on the computer! 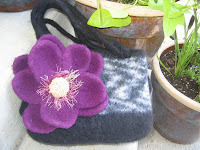 I made the little black and white number with the outrageously large purple flower for my friend, Dee. It actually looks cuter in person than on the picture, but there is no doubt that the flower is BIG!! I offered to make a smaller one, but no, she was determined to have the biggie! She thinks it's just great, and believe me, people DO notice her bag!! 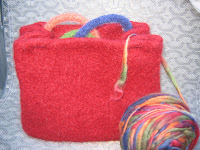 As of late last night, or should I say early this morning, I have goodies coming from both WEBS and Yarn Country. This being on the computer half the night can get a person into trouble! Oh, but I can hardly wait to see the lovelies I ordered. Oooooooh!!! I'll have to post pictures when they arrive. I also ordered a pattern to try a simple lace shawl, which will be another first for me. AND...... I also have illusions of being able to knit a mobius! Think I'll start with the little basket, and yes, I did order the yarn for that, too! I absolutely love your bags. They are simply adorable. Do you pronounce your name with a "long a" in the middle or "short a"? One way I tell people how to pronounce my name is that it's like "Atlanta", without the t's! It does get mispronounced, though. I get the "long a" and also the "ah" sound. I've got several more bags on the verge of being finished, so hopefully I'll get pics posted before too long. I just finished the one for the ITE IV, and am very pleased with how it turned out. It was my first attempt at needle felting, and it was great fun! Are you kidding? I absolutely LOVE the size of that flower! Oh my it is stunning! Where did you get your pattern for the flower? A Surprise in the Mail! !